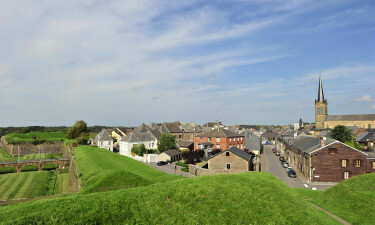 Lac des Vieilles Forges is a great campsite which gives you the possibility to combine bucolic walks on the hills with the discovery of the fortified castles surrounded by lush scenery and centuries-old secrets. The campsite has a beautiful location only 50 meters from the lake where you can take a swim, relax in the sun, or try out windsurfing. 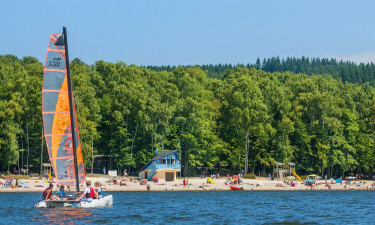 Lac des Vieilles Forges gives you the possibility to combine a relaxed camping holiday with fun activities and entertainment for both children and adults. 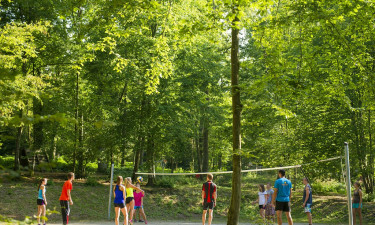 You can try out different sorts of watersport by the lake, go on forest adventure, hire a segway, or play football, volleyball, table tennis, cycling, and basketball at the campsite. The youngest guests can enjoy participating in the kids club which organizes activities and games for the children at age 6-11. Camping Lac des Vieilles Forges offers a great snack bar, where you can enjoy a tasty snack. Furthermore, you can quench the thirst with cold and refreshing drinks from the bar. If you want to cook your dinner in your mobile home, you can swing by the small grocery shop at the campsite. Only 6 mi from the campsite you can discover small shops, a pharmacy, a doctor, a petrol station, a souvenir shop, and a bar/tobacco. Furthermore, you can find a big supermarket only 8 mi from the campsite. If you want to go on a restaurant, La Ferme Du Pont Earl is a nice place to enjoy a delicious meal.